Please note that we are unable to ship this Giant Fathom E+ 2 29 outside of the UK. 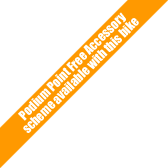 This Giant Fathom E+ 2 29 2019 is available with our legendary Podium Point free accessory scheme. The Fathom E+ is a great choice for XC and singletrack terrain. A lightweight ALUXX SL aluminium frame and trail-friendly geometry will help you experience trail riding like never before. The SyncDrive Sport motor delivers smooth, instantaneous power to conquer hills and technical trails. The side-release EnergyPak is integrated into the frame and can be easily removed for charging. And you can control all your settings with the clean, easy-to-use RideControl ONE setup. Innovation, manufacturing expertise and a motor system powered by Yamaha all combine to expand any rider's abilities. SyncDrive Sport offers three support modes and is equipped on E-bikes that are used for both everyday riding and for more demanding off-road riding. This small mid-drive motor delivers a massive maximum 80Nm of torque and is widely acclaimed for its performance and reliability.